‘Renown’ in gleaming condition presumably standing in a station. Express headcode and the pristine ballast would seem to say running line. Posts over the tender suggest very tall signals although any repeater arms not visible. The land slopes up up beyond the engine and even higher ground is visible above the tender. The chimney of the hut behind the train is stone or blocks rather than brick. Sorry, I have no idea where this was taken - and it has puzzled me for years. My print has the name "C. A. J. Nevett" carefully written on the back, so I presume he was the photographer. If anyone knows who he was and where he lived, it might be a (very) slender clue. Sorry to say I' not totally convinced by this being Oxenholme. The diverging tracks in the foreground would be from the down Goods Loop to the Down Branch, and to the stop block (latter removed before 1914). But there seems to be too big a space (in the photo) between them and the Bay Line. Also the twin signal posts seem to be immediately behind the engine, whereas at Oxenholme they were on the Up side of the lines. That could just be an illusion, though. Also, given the angle of the camera w.r.t. the loco, it should be possible to see Oxenholme No.3 box on the left, whereas the low building should be out of shot. If it is indeed Oxenholme, the alignment of the tracks on the Down side must have been significantly altered, and then altered again before 1914. What date does anyone think would be right for this photo? There was a Charles Albert Nevett, a bricklayer in Much Wenlock, Charles Jacob Nevett in Clerkenwell and Arthur Charles J Nevett in Edmonton, but I have been unable to identify any C A J Nevett anywhere in the UK. Thinking about it some more though, maybe the engine was stood just over the points Down Main to Down Branch, on the Down Branch line. In which case the diverging tracks in the foreground are Bay line to Down Branch /Up Branch and the Down Goods Loop and siding are out of shot to the bottom. The position of the signal posts would then work. With such a camera position, it is just possible that No.3 SB is just out of shot to the left. I can't see any shadows, but maybe the sun is on the same side of the camera, ie in the west. What through express trains ran onto the branch in the afternoon/evening? Many thanks John: I'm sure your identification is correct. The track layout fits that shown on the OS plan in Portfolio No 12 "Recollections of Oxenholme" and as described by W. L. Harris (pp 8 & 9). The photo is looking south-east, with Oxenholme No 3 signal cabin off to the left and the track in the foreground leading off to the right into the so-called "bay platform". My notion that C. A. J. Nevett may have taken the photo is probably quite wrong, as the absence of a central lamp-socket on the engine's bufferplank shows that the date must be 1899 - 1902. 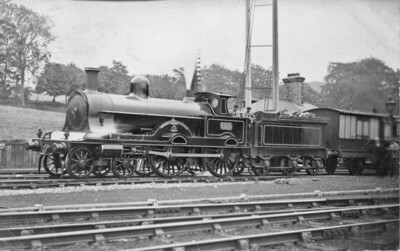 A photograph by H. Gordon Tidey, taken about a quarter-mile north of Oxenholme and showing G2 No. 253 on a Down goods train, confirms the location of the mystery photo. In the far distance can be seen (under magnification) Oxenholme No 3 signal cabin, then a sleeper fence, twin telegraph poles, a bracket signal post, then a hut with a tall chimney (just like the hut behind 'Renown'), then the station Up platform end. This photo was taken in 1923 - 7, so there was a period of at least twenty years for the alteration of the signal. A reproduction of this photograph is on the cover of H. Gordon Tidey's 'My Best Railway Photographs' (Ian Allan, 1949), and a similar Tidey photo of 19-inch No 1512 is on page 163 of Brian Reed's 'Crewe to Carlisle' (Ian Allan, 1969), and in O. S. Nock's 'LNWR - Pre-Grouping Railway Scene No 3' (Ian Allan, 1980) on page 78. I vaguely remembered that Malcolm Lewis once told me something about C. A. J. Nevett, so I phoned him and asked for details. He says that C. A. J. Nevett was a Crewe apprentice and a good photographer. He has several prints with �C. A. J. Nevett� written on the back as the name of the photographer and has seen one or two of his photographs published in The Railway Magazine, where the name is given as �C. A. Jebb-Nevett�. One such photograph was published in The Railway Magazine in 1928 and shows two �Claughtons� leaving Crewe on the 8.30am Carlisle � Euston, the leading one being 5970 rebuilt and the train engine being 5930 unrebuilt. The photograph is credited to �C. A. Jebb-Nevett�. The only likely Nevetts I can find born in England & Wales (on the Free BMD pages) are "Charles Aldred J." and "Charles Alfred J. ", both born in Stockport in 1907. Cousins, maybe? Either seems possible as a Crewe apprentice in the 1920s, but the date would obviously exclude him as the photographer of 'Renown'. So I guess my print with his name on the back was merely from Nevett's collection.